Dust 514: Beta key Giveaways! 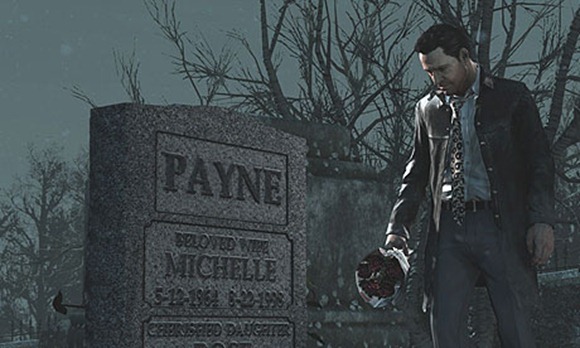 Nine years have passed since the last game in the series and while graphics and gameplay may have changed greatly, the main man himself remains as he was left. Max Payne, unable to move on from the murder of his wife and daughter seeks salvation in bleak bars and at the bottom of whisky bottles. This addiction to brown liquor and pills, although not the characteristics we’d expect from a protagonist, plays a significant role in character development and realistic reaction to the trauma he has faced. Watching a man systematically destroy his life because it eases the pain becomes one of the main themes for Max Payne 3. While there are likely to be many variant reading of disapproval and disgust at this behaviour. The dominant feeling is that of pity for Max. Unlike many other third person shooters fighting through large quantities of enemies, Max Payne feels the most human and relatable I have ever come across. Rockstar have constructed their protagonist almost perfectly. 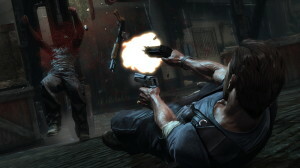 Location in Max Payne 3 is one of the biggest changes over its predecessor. No longer confined in the dark rundown representation of New York, Max Payne 3 opts for a more sunny approach that is found in São Paulo. Max is now working as a private security guard for the wealthy Branco family. Of course it wouldn’t be Max Payne unless there were elaborate schemes afoot and so the kidnapping of Rodrigo Branco’s trophy wife Fabiana sees Max begin the retrieval for his employer, only to discover things aren’t all they seem. There is a large variety of different scenery that the player finds themselves in. From the poor streets of a slum to the bustling São Paulo nightclubs, no two levels look the same. All unique and all beautifully designed. Controversy and a sense of dark irony can be found throughout the game, the idea of a wealthy family looking over the poverty of the outer city from a penthouse party brings forth one such example. While many games would overlook such a controversial issue, Max Payne seems to address it directly. Pointing to this failed distribution of wealth within the society while almost asking the player how this is allowed to persist. As well as highlighting issues of corruption that can be found in many third world countries, the game almost conveys positive connotations to those who are driven into gang affiliation. Suggesting that it is a means of survival for those who are poor, when all they have is a gun and a dream. Mixed with an incredible performance from James McCaffrey playing Max, delivering every line from the outstanding written script and playing the perfect mix of cynical, dark, out-of-place and still badass character we associate with Max Payne. The level of writing in both interactions and even the running monologue are of the highest quality, as you’d expect from a Rockstar game and wouldn’t look out-of-place in any hollywood film. 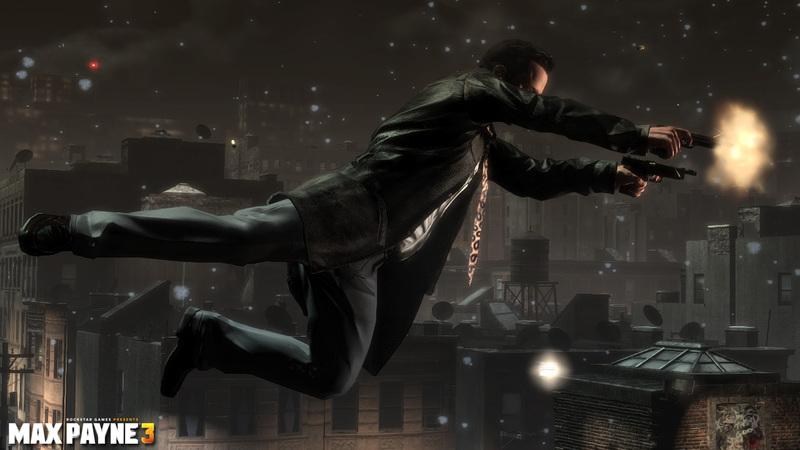 In fact Max Payne 3 is almost a film in itself. Gameplay is separated frequently by cinematics and over the top quick time events. While this means the story is more compelling and action packed there is one fundamental flaw with this. It feels as if gameplay has taken a backseat to story. While gameplay in Max Payne is not bad by any means, far from it. It feels that these frequent cut scenes are intrusive to the players gaming experience. Max Payne is almost something you simply watch instead of control. When you are tasked with controlling Max the formula is always the same, move from point A to B while killing everyone among the way, the standard linear shooter’s formula. However Max Payne feels more than that. While the game only really gives one way of progressing this is easily excused by the level of detail within the environment. repetitive shooting is less tedious due to the bulletdodge ability, in which Max will throw his body in a direction, aiming up shots in slow motion and moving towards cover simultaneously. Not that the cover may be sustainable for very long, Max Payne’s destructable enviroments looks impressive and realistic, adding a faster pace than simply camping behind one wall. The lack of regenerating health also forces players to think about how they will engage situations as well as the pace of the action. When a player has a lot of pain killers, it’s not uncommon to see them take more risks with a faster more audacious play style. This contrast in the speed of the game keeps it interesting and engaging and it provides a great feeling when you find pain killers on the brink of death. Kill cam see’s the camera follow a the killing bullet into the last enemy, all while in slow motion. Players can choose to either slow the process even more, or fire more shots into the dead man. While this process is visually striking, as well as informing the player when a wave of enemies is defeated. It also exhibits the violence within Max Payne. Throughout the play through there are many acts of brutality and some shocking images that more than warrant the 18 certificate. However these images aren’t brutality for the sake of it, they are realistic constructions of violence within poorer parts of the world, especially gang orientated violence. All the violence conveys a message that most other games wouldn’t dare address and this bravery is refreshing in such a saturated market. Multiplayer is a surprise gem in Max Payne. Though I had low expectations upon entering, after my first few games alone I was convinced that it is a definite worthwhile addition to the game. Not only does it provide a surprisingly deep customisation it also has several game types that can months of extra gameplay, with new modes such a gang wars a mix of narrative with an outcome determined by the players, as well as the classics such as deathmatch and team deathmatch. There is even a rookie mode to ease players new to the online by pitting them against equal low-level players. 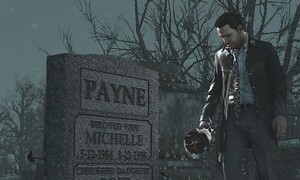 Overall I enjoyed every second of Max Payne 3 and felt fully engaged by its story and style. Several modes such as arcade mode and New York minuite add an incentive to play through the game again as well as the vast collectables throughout the game. Each clue is followed by a section of dialogue that can provide some very interesting information which makes Max Payn’s story feel deep and realisitic. Rockstar have really outdone themselves this time.